Welcome to Prof. Kim's Research Group! Dr. Kim received the 2018 UNL Distinguished Teaching Award and the College of Engineering Holling Family Master Teacher Award. Click here to see a photo taken. Our students (Mahdieh, Capri, Sussan, Hani, and Ernesto) presented papers at the 2018 UNL Research Fair. Ernesto received the Best Poster Award. Congratulations! Click here to see a photo taken at the event. Dr. Kim and group members attended the 2018 Transportation Research Board Annual Meeting. They presented papers and joined many meetings for technical discussions. Click here to see some photos taken in DC. 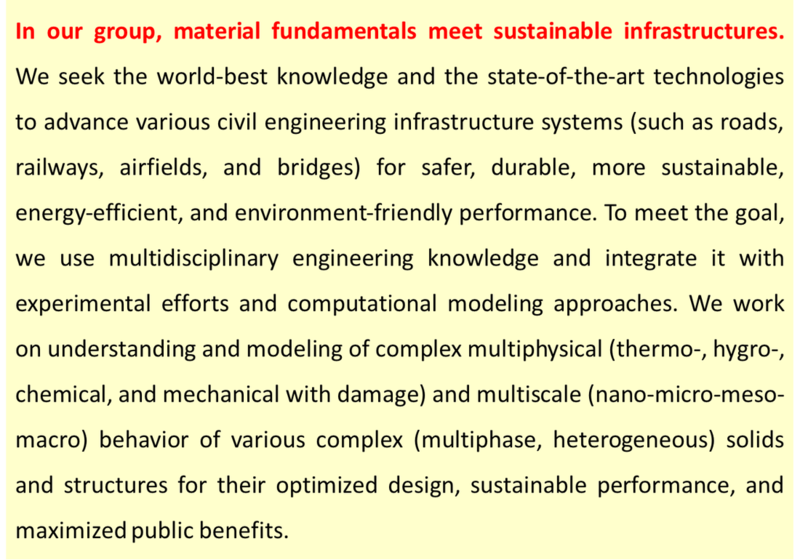 We are looking for graduate/undergraduate students and research staffs who are highly motivated to the theoretical, experimental, and computational research on sustainable infrastructure and materials. Please don’t hesitate to contact us for any questions or inquiries.